JSE-listed beverages group, Distell, has agreed to distribute and market a cannabis-infused beer backed by RCL Foods CEO, Miles Dally, and Spar CEO, Graham O’Connor. Distell, the producer of Nederburg wines and Klipdrift brandies which has no beers in its portfolio, reached a “distribution support” agreement with Poison City Brewing, said the craft brewer’s co-founder, Graeme Bird. Poison City Brewing started selling a lager containing hemp — a variety of the cannabis sativa plant that is devoid of mind-altering ingredients — in major liquor chains in September. The launch coincided with a Constitutional Court ruling that effectively decriminalised the private use of cannabis in SA. 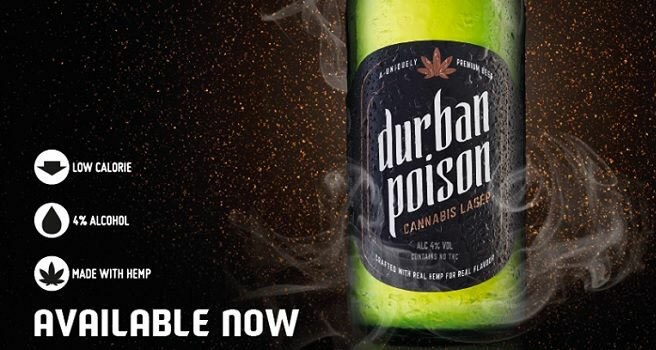 Bird said a distribution partnership was necessary because demand for the brewer’s Durban Poison Cannabis Lager had “overwhelmingly exceeded capacity”. The agreement would allow Poison City Brewing to meet demand for the beer through both formal and informal channels. “Distell, as one of the leading liquor beverages companies in SA, has a powerful route-to-market platform and will step change our consumer and market reach,” Bird said. In late October, Distell reported that revenue in the first quarter of its 2019 financial year was flat because volumes were slightly lower. Nevertheless, the company’s shares have climbed 11% since the trading update. Often through partnerships, global beverages companies are dipping their toes into the burgeoning cannabis market, which received a major lift in October when Canada legalised the recreational use of the plant. The world’s biggest brewer, AB InBev, said in October it was keeping a close eye on the cannabis market. “Recent trends in Canada and in certain US states toward legalisation of recreational marijuana are an important development — not only for us as a beer company but for society as a whole,” the group said. In August Constellation Brands, which makes Corona beers in the US, invested another $4bn into Canadian marijuana company Canopy Growth.